How can I import a photo from an iPad? 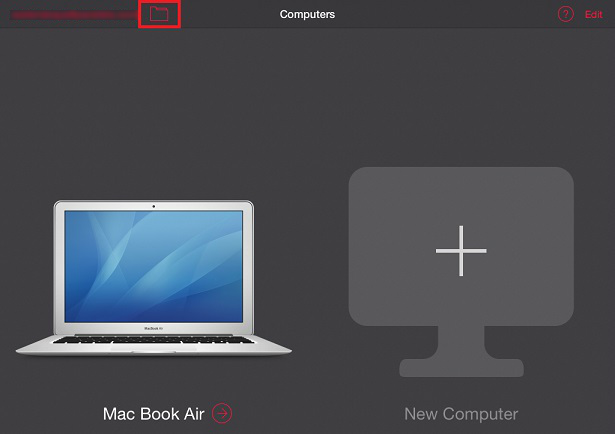 With the help of Parallels Access File Sharing option you can share a photo or a picture from your iPad with a remote computer. The File Sharing option is available on the screen with your computer list, on the screen of a remote computer after you connect to it, and from the toolbar, when you use a remote application. Click on the folder icon from any of the screens. You will see the screen with the On this device option. Click on it. Now select, whether you would like to share an existing photo from the iPad library, take a new one, or share a file from iCloud Drive. when you select the file, it will be added to the screen. To move the file to a remote computer, drag it and move to the remote computer, do not release it. When you hold the file on the remote computer, you will see the list of folders on the computer where you can move the file to. Drop it on the folder you would like to keep the file in. Now the file is available in the chosen folder on your remote computer. How can I import a photo from an Android device?